These latest and greatest warm-weather cocktails will snap you into a sunny mood in no time. Even though this Lower East Side spot is more about the scene than the cocktails, rest assured the cool kids wouldn’t dare settle for mundane drinks. While there are several worthy contenders for best summer drink (Spanky’s margarita, Pirate Rose), we say go for this beauty. The bare-bones ingredients of cucumber juice and Beefeater gin sound deceptively simple for how smoothly the crisp, melon-tasting drink goes down. 107 Eldridge St (212-257-4072, theflowershopnyc.com). $13. Until Tomorrow is a pint-size neighborhood bar in Clinton Hill where the staff treats everyone who enters like a regular. And the creative cocktails are crafted with the same level of care, especially the tiki-influenced Donkey Kong. The rum is infused with currant roll in-house, and the muddled bananas are brûléed in front of you with a blowtorch. Espresso powder is sprinkled on top, creating a complex, bittersweet quaff that’s best enjoyed in the bar’s backyard patio. 507 Myrtle Ave, Brooklyn (347-987-4181). $12. This cocktail bar is not what you think. Connected to the meatcentric, slightly bro-y Cannibal restaurant, it’s painted with mint-green walls and adorned with photos of a bike-riding Pee-wee Herman, and it offers surprisingly tropical drinks you wouldn’t expect to find in the nearby Murray Hill frat zone. Take the milky, Creamsicle-flavored Harvey Wallbanger with house-made orange marmalade, vodka and vanilla; it’s a standout for its fruity flair and fresh pluck. 111 E 29th St (212-685-5585, thecanniballiquorhouse.com). $14. 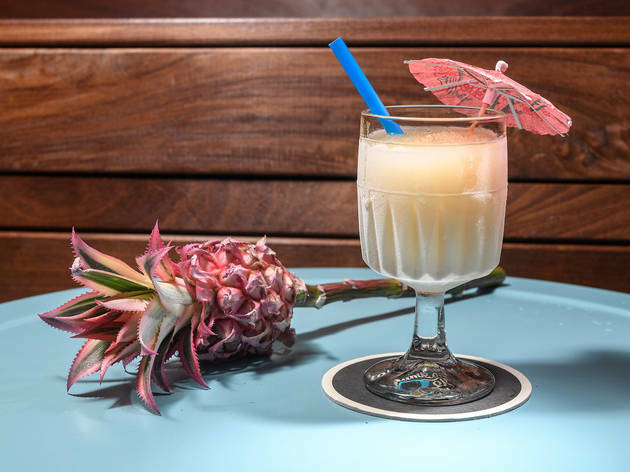 Tiki drinks are all the rage at the Commodore and El Cortez, the funky bars from Chris Young & Co. And that certainly holds true for the group’s newest venture in Greenpoint. Out of the playful list of cheap, tropical drinks, go for this NOLA staple. The heady mix of vodka, gin, amaretto and triple sec is masked by the syrupy-sweet grenadine, and grapefruit and pineapple juices, giving you stormy flashbacks to wild times on Bourbon Street. 579 Meeker Ave, Brooklyn (718-504-7776). $10. Okay, so the old-fashioned should have no place on a summer-cocktail roundup. The whiskey-heavy quaff is usually used as a cold-weather warmer. However, this refined version, served at the jazz-bar–restaurant in Midtown East, is lightened with either fig jam or demerara sugar, depending on the base, and presented in an oversize wine glass. The fiery mesquite (one of four different “smokes” you can choose) is reminiscent of a bonfire on the beach. 9 E 37th St (212-725-3866, fineandrare.nyc). $20. The setting, a dim lounge inside Hotel on Rivington filled with highfalutin art, may not evoke summertime sensations. 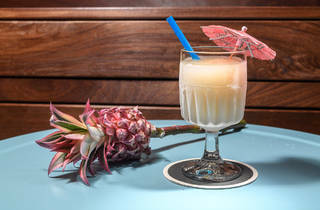 But staff at the new cocktail bar slash art gallery, from Albert Trummer (Apotheke, Sanatorium), whip up a drink that’s like a boozy milk shake with an island twist. The Panda blends Don Q Coco rum with white crème de cacao and coconut milk, creating a dreamy, vanillalike concoction that—be warned—you’ll down way too fast. 107 Rivington St (212-796-8040, szen.nyc). $14. It’s the drink that launched a thousand accolades—only now in slushie form. The frosty little sibling to Attaboy’s acclaimed Penicillin is still spiked with Scotch, ginger, lemon and honey, but it’s now mixed with ice and topped off with a mini umbrella. Drink it in the palatial backyard of the new Crown Heights space, on a swinging white bench under twinkling string lights—and be sure to thank us later. 1057 Atlantic Ave, Brooklyn (diamondreefnyc.com). $12. If you crave a spicy-sweet combo of margaritas come June (and who the hell doesn’t? ), skip the cheap happy-hour tipples and try this elevated iteration right on the ground floor of the famed Woolworth Building. The blushing drink is an energizing balance of tart sweetness (courtesy of grapefruit juice and sherry wine) with a tingle of spice from serrano peppers. And the rim is swiped with black salt, just to emphasize that this ain’t your aunt’s margarita. 9 Barclay St (212-571-2930, thewoolypublic.com). $15. Let’s face it: It’s not really summer until you’re drinking the strong stuff out of a coconut. And that Instagram-worthy drink should be this elixir at Upper East Side subterranean speakeasy Sugar East. A slowly burning cinnamon stick juts out of the fruit, emitting an earthy scent that complements the sweet mix of light and dark Havana Club rums, absinthe, fernet, and coconut and lime juices. It’s an intoxicating mix that’s somehow worth its nearly $20 price tag. 1125 First Ave (212-832-4610, sugareast.com). $18.